This is a book for grown-ups. It is serious. It is sad. It is uplifting. It is every psychologist’s nightmare-com-true. Forget the fact that most of the subject matter in this book and in the main character’s life is in direct conflict with most of my personal beliefs. Well, let me clarify… This book is about a man’s search for redemption and peace within his own continually muddled, messed up, mis-stepped life. Most of the troubles he has are of his own making, well, probably all of them are. But the struggle! The utterly astonishing, heartbreaking journey the character takes is divine in it’s soul-searching-ness. You’ll really have to read this one to understand. Couple the amazing, harrowing storyline with the fact that Gregory David Roberts is able to craft sentences like unto nothing I’ve ever read in their poetic, touching genius, and this book is a masterpiece. It’s a heavy read. And it’s huge. Several hundred pages. It’s a volume. So, read it if you’re looking for a gorgeous book about one man’s struggle to make peace with himself. Read it with a pen in hand to underline your favorite quotes! PS: Johnny Depp bought the motion picture rights for this book… Should be interesting! I was thinking the same as Jolene!! Hahaha. Great review though.. even though I'm a teen.. So I'm gonna hold of reading it! Jolene - I'm really excited to see what Johnny Depp does with this! It would be a departure from the book for him to play the main character, as the author describes himself as an "unattractive" man more than once. Thanks for writing a great review. 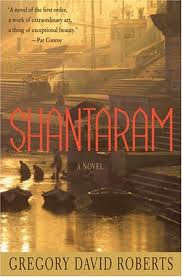 Now, I can't wait to read Shantaram. I just requested it from the library!